The Liberals are up to their shenanigans, and Nikki Haley is the bait. They want Nikki to believe that if she renounces her Tea Party affiliation, they will treat her as the New South. Public life in this tiny town — all two main roads of it — centers on the Hardee’s, the strip mall with the town’s grocery store and Family Dollar, and Rusty-n-Paula’s Restaurant. Most mornings, Rusty’s is where the town comes to chat — or argue, as the case may be. Haley comes up often: “Everybody in Bamberg likes her,” said waitress Dianna Crosby. And in recent days, the talk has focused on the Confederate flag, which Haley is pushing to have removed from the South Carolina statehouse grounds in the wake of the racially motivated massacre of nine African Americans at Emanuel AME Church in Charleston. Her home town, Haley often says, has changed since the days when, as an Indian American, she could not qualify to become either the white or the black pageant queen. But even with one of their own leading the charge, the town is like much of the rest of the state on the flag: sharply divided along racial lines. All this racial division, and Nikki Haley has her OWN sign leading into the town? And I almost forgot…the very town where she is madly popular is in the state that ELECTED HER GOVERNOR! 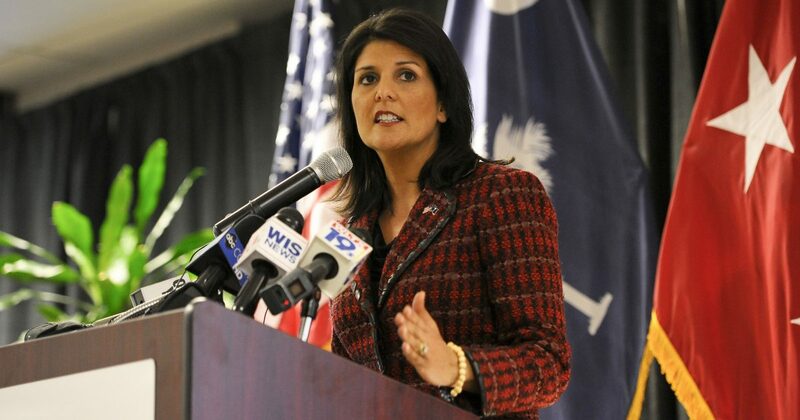 If South Carolina is so bad, then how did Nikki Haley become governor? Nikki Haley is a TRIBUTE to the Tea Party and the Confederate flag. She REPRESENTS the same South that the Left attempts to demonize. It’s amazing that every time the Left discloses the racism of the Right, and of the South, they seem to overlook the OBVIOUS! This particular article warned that in order for Haley to maintain her New South, she would need to shed the vestige of the Tea Party. Like the Dylann Roof shooting has nothing to do with the Confederate flag, none of this is connect to the Tea Party, at least not negatively. The Left will never quit trying to kill the Tea Party, and they should know that the Tea Party is not going away.